You have to first of all understand nothing about the Trans-Atlantic Slave trade. The emphasis is mine, and the problem with that part of this meme is that it makes the unwarranted assumption that, as evil as it is, slavery is useful for something. That slavery is more effective than freedom at creating wealth. But history says that it isn’t—and former slaves agree. In fact, slavery kills wealth, and what wealth it seems to create is a hollow shell that crumbles once it is no longer propped up by the state. This was true in Sparta—it is why we use the adjective “Spartan” to mean living in minimal wealth—and it was true in the American South. That’s why the Confederacy was at such a disadvantage during the war: because the North was so much better at wealth creation, and had been since the North abandoned slavery. Because the North abandoned slavery earlier, they were ahead of the South in wealth creation, which meant the ability to wage more effective war. Throughout history, the slave trade has retarded wealth growth everywhere it has been used, from Sparta to the American South. That was one of the things that (somewhat paradoxically) most disappointed Frederick Douglass when he escaped to the North: he had assumed that even though slavery was evil, at least his suffering had enhanced the lives of slaveowners. Instead he found that even many former slaves in the North lived in greater luxury than slaveowners in the South. …I visited the wharves, to take a view of the shipping. Here I found myself surrounded with the strongest proofs of wealth… I saw no whipping of men; but all seemed to go smoothly on. Civilization is held back by slavery. 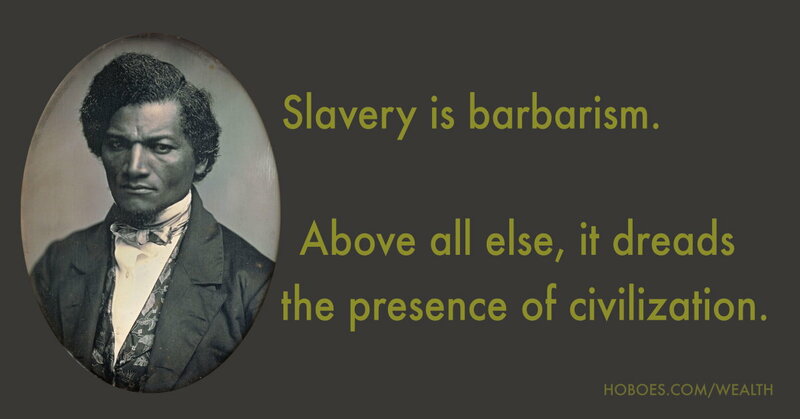 As Douglass says, slavery is barbarism. The cultures that have moved civilization forward have been those that were more free than their neighbors. The wealth we have did not come from slavery. It came from ending slavery. Our wealth came from freedom. There is this idea that the South, after the devastation of the war, took decades to recover; and in many areas it did. But not in those industries that had been dominated by slavery. Just five years after the War’s end, cotton production approached the peak antebellum levels, and in 1891 U.S. output was twice the highest level ever achieved in the pre-War period (Carter et al. 2006, Da756). Amid the chaos of the immediate post-Civil War era, freedmen and landowners experimented with new systems of labor organization—a groping process that would lead to the rise of sharecropping coupled with many state and local attempts to coerce laborers. Coercive policies included vagrancy laws, unfavorable crop lien laws, anti-tampering agreements, and the like. But any attempt to equate these policies with slavery does a disservice to the memories of those who suffered under slavery. Does he [the slave] ever venture to suggest a different mode of doing things from that pointed out by his master? He is indeed presumptuous, and getting above himself; and nothing less than a flogging will do for him. Douglass understood where wealth creation comes from: it comes from innovation, and more specifically from the freedom to innovate. Had the South ended slavery sooner, they would have been wealthier, because their employees would have been free to design advanced tools and methods to increase crop production—that is, to increase wealth—without fear of a flogging or worse. Slavery meant a net decrease in wealth that was not overcome until slavery ended. Nor did the infamous “triangle trade” create wealth. At every point of the triangle wealth was lost. The wealth that went into the slave trade was lost. The slaves that came out of Africa were gained through war and intertribal depredations, that is, through wealth destruction. From the American South to the Caribbean, the nations that used slavery to create goods lost wealth compared to those which did not. Buying and selling human beings is a net loss, and those that used it fell behind. When a nation participating in slavery ended their participation, their wealth production increased rather than decreased. The idea that slavery is a wealth-creator is a falsehood that whitewashes slavery and legitimizes slaveowners. It partially excuses an inexcusable evil. It is wrong, and dangerously so. Freedom creates innovation, which creates wealth. Slavery destroys innovation and dissipates wealth. Any society that uses slavery will see its wealth fall compared to those that do not. Slavery makes us poorer, not wealthier. Both the United States and Europe would be wealthier today had they never employed slavery. A Muslim flight attendant refuses to serve drinks out of religious conviction. Would it be right for her employers to start a social media campaign publicizing her past drinking? The last time an actor assassinated a president? When, asks Johnny Depp, was the last time an actor assassinated a president? The only reasonable explanation for this question is that Depp is a secret conservative. Slavery does not create wealth last modified March 6th, 2018.